Alight Fingers provide juggling performance and circus workshops for all kinds of events, corporate or private, large or small. Just get in touch, and we'll be more than happy to talk through how we can help. You'll catch this blur of movement in the corner of your eye, and then spend however long trying to work out how it's done, how many objects are being juggled, and more to the point, how many hands. Alight Fingers can also be booked to provide circus workshops. We call it 'learning through play' because we like to emphasis those aspects, but it's often called circus skills, or a circus workshop. We think calling it learning and playing is simply a much nicer way of looking at it, as well as providing a happier attitude for approaching these things. 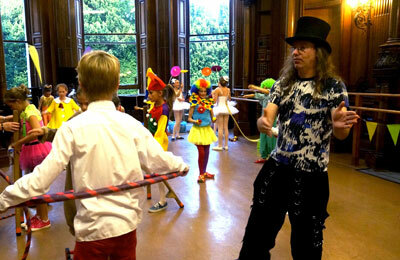 We work with children and adults, at all kinds of events, from circus parties to corporate team building. Our clients range from schools and scouts and guide groups, to corporate events for government agencies, blue chip companies, and international airlines (yes training two hundred air hostesses and stewards to juggle was a lot of fun). We provided the circus workshop for the opening ceremony of the Paralympics. We do children's (and adults) parties, weddings, hen and stag nights, and of course we can also be found at fete's, and carnivals and anywhere else you'd expect to find a little bit of circus. You can also hire us for one to one tuition which makes a pretty novel birthday or christmas present. We work/play mostly around Hertfordshire, Bedfordshire, Buckinghamshire, and Essex. The furthest we've gone so far was for a series of shows in Latvia, so we can be persuaded to travel. Just get in touch, and we'll see how we can help. I Am The Juggler Which circus act are you? If you find any spelling mistakes, etc etc, they're on purpose... no really.. but feel free to email me about them anyway. Fancy having a go at learning to juggle 3 balls in the comfort of your own home, then try our on-line 3 ball juggling lesson. Of course, remember when juggling in front of your computer, not to drop things on the keyboard. Alight Fingers can teach you a whole load of tricks with three balls and more. And then there's diabolo's and devilsticks, plate spinning, poi, and of course, the not insignificant matter of how to balance a chair on your chin. For more details consider booking us for a juggling and circus skills workshop.